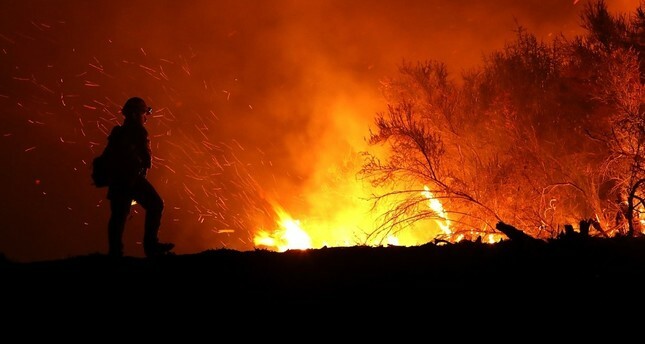 A California firefighter monitors the Medocino Complex fire. As out-of-control wildfires ravage large swathes of Greece, Portugal, Spain and northern California, scientists are warning that the wildfires can get much worse due to global climate change. While other factors have fueled a sharp increase in the frequency and intensity of major fires, including human encroachment on wooded areas and dodgy forest management, climate change has made everything worse as millions of acres are on fire around the world. The fire, in the area around Monchique, about 300 kilometers (180 miles) south of the capital, Lisbon, has charred almost 23,500 hectares (58,000 acres) of woodland, according to the European Forest Fire Information System. The fire has cast high plumes of dark smoke across the Algarve coast, dimming the sun on some of the famous beaches in one of Europe's top vacation destinations. More than 40 people have been hurt, one of them seriously, and hundreds evacuated from villages and hamlets during Portugal's worst wildfire of the year. In neighboring Spain, light overnight rain helped stop the progress of a wildfire near Valencia, on the Mediterranean coast. However, authorities in Portugal and Spain said Thursday they have halted major wildfires but warned the battle isn't over yet. While in California, the fires all grew explosively in the past two weeks as winds whipped the flames through forest and rural areas full of timber and brush that is bone-dry from years of drought and a summer of record-breaking heat. "The patient was already sick," in the words of David Bowman, a professor of environmental change biology at the University of Tasmania and a wildfire expert. "But climate change is the accelerator." So how does climate change affect wildfires around the globe? Fine weather for a fire: Any firefighter can tell you the recipe for "fire conducive weather" - hot, dry and windy.No surprise, then, that many of the tropical and temperate regions devastated by a surge in forest fires are those predicted in climate models to see higher temperatures and more droughts. "Besides bringing more dry and hot air, climate change - by elevating evaporation rates and drought prevalence - also creates more flammable ecosystems," noted Christopher Williams, director of environmental sciences at Clark University in Massachusetts.In the last 20 years, southern France and Portugal have seen three or four droughts of a magnitude that used to occur only once a century. More fuel:Dry weather means more dead trees, shrubs and grass - and more fuel for the fire. "All those extremely dry years create an enormous amount of desiccated biomass," said Michel Vennetier, an engineer at France's National Research of Science and Technology for Environment and Agriculture (IRSTEA). Change of scenery:To make matters worse, new species better adapted to semi-arid conditions grow in their place. "Plants that like humidity have disappeared, replaced by more flammable plants that can withstand dry conditions, like rosemary, wild lavender and thyme," said Vennetier. "The change happens quite quickly." Thirsty plants: With rising mercury and less rain, water-stressed trees and shrubs send roots deeper into the soil, sucking up every drop of water they can to nourish leaves and needles. That means the moisture in the earth that might have helped to slow a fire sweeping through a forest or garrigue is no longer there. Longer season: In the northern hemisphere's temperate zone, the fire season was historically short - July and August, in most places. "Today, the period susceptible to wildfires has extended from June to October," said IRSTEA scientist Thomas Curt, referring to the Mediterranean basin. In California, which only recently emerged from a five-year drought, some experts say there's no longer a season at all - fires can happen year-round. More lightning: "The warmer it gets, the more lightning you have," said Mike Flannigan, a professor at the University of Alberta, Canada and director of the Western Partnership for Wildland Fire Science. "Especially in the northern areas, that translates into more fires." Worldwide, he notes, 95 percent of wildfires are started by humans. Weakened jet stream: Normal weather patterns over North America and Eurasia depend heavily on the powerful, high-altitude air currents - produced by the contrast between polar and equatorial temperatures - known as the jet stream. But global warming has raised temperatures in the Arctic twice as fast as the global average, weakening those currents. "We are seeing more extreme weather because of what we call blocked ridges, which is a high-pressure system in which air is sinking, getting warmer and drier along the way," said Flannigan. "Firefighters have known for decades that these are conducive to fire activity." One of these blocked ridges, he added, will be parked over the Pacific Northwest for the next 10 days, according to forecasts. Unmanageable intensity:Climate change not only boosts the likelihood of wildfires, but their intensity as well. "If the fire gets too intense - and we are seeing this in California right now, and saw it in Greece a few weeks ago - there is no direct measure you can take to stop it," said Flannigan. "It's like spitting on a campfire." Beetle infestations: With rising temperatures, beetles have moved northward into Canada's boreal forests, wreaking havoc and killing trees along the way. "Bark beetle outbreaks temporarily increase forest flammability by increasing the amount of dead material, such as needles," said Williams. Positive feedback: Globally, forests hold about 45 percent of Earth's land-locked carbon and soak up a quarter of human greenhouse gas emissions. But as forest die and burn, some of the carbon is released back into the atmosphere, contributing to climate change in a vicious loop that scientists call "positive feedback."